Worst Best Picture: Is Kramer vs. Kramer Better or Worse Than Crash? In “Worst Best Picture” we search every single Best Picture Oscar winner of all time from 1927 to present to uncover the worst of them all. Conventional wisdom says that 2005’s winner Crash is the worst winner in history. We won’t stop until we’ve tested every last one. Read the the first, our review of Crash, here. Posts will be relatively spoiler free, but there may be some details revealed. 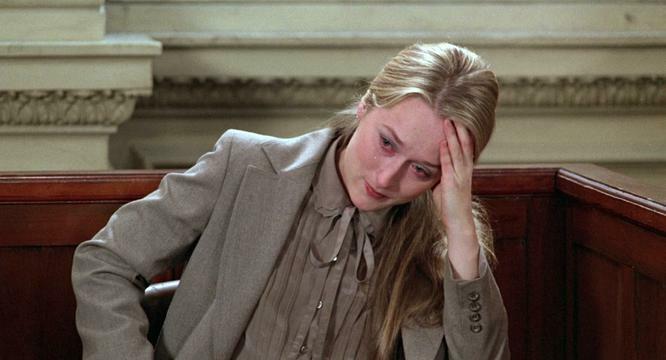 Today’s installment is the 1979 winner Kramer vs. Kramer. Is it better than Crash? My parents saw Kramer vs. Kramer on one of their first dates. My parents, both relatively recently divorced at the time, weren’t really in the right place to watch it. It’s also not really a great “date movie” on account of it being a movie about a divorce and a custody battle. It’s been a long-running joke in my family that Kramer vs. Kramer was the last movie my mom got to pick out while they dated. It’s easy to see why: this is a damn brutal movie. I have no children and I haven’t been divorced and it hit me like a truck carrying another truck. If you’ve got some deeper connections to the themes, well, prepare yourself. Within the first ten minutes, Joanna (Meryl Streep) leaves Ted (Dustin Hoffman). We aren’t given a lot of insight into exactly what’s wrong, but it’s clear that Joanna is unhappy, and she’s apparently unhappy enough to leave their son Billy (Justin Henry) behind, as well. Ted has to learn to balance a demanding job and a single parent household, and Billy has to learn to forgive his dad without really having any explanation for why his mom left. It’s hard stuff, but mom left completely, so everyone involved has to learn to start over. Meryl Streep is out of the movie for a solid hour. It’s entirely about Ted and Billy bonding, and the mix of heartfelt moments and tough moments is effective. Billy wants his mom back, sure, but if all he has is dad then he’s going to make the best of it. Ted’s worn out and frustrated — one scene involves him making a drink and staring at a wall for a brief moment — but he’s proud of himself for being able to take over parenthood alone. That makes it all the more difficult when Joanna comes back and wants to be in Billy’s life again. The custody battle is the bulk of the movie’s conflict, and it deserves not being spoiled at all. It’s emotional and powerful, and it’s amazing to see Dustin Hoffman and Meryl Streep both give (possibly) their best performances in the same movie. If I’m wrong there, then perhaps you can downgrade them both to “excellent” here. What stands out the most is the difficult line that the story walks about who the “hero” is. We spend a full hour with Ted, but Joanna tells the court the story of the Ted we never got to see: married Ted. The real answer isn’t that Ted is a good father or that Joanna is a bad wife or that Ted is a bad husband or that Joanna is a good mother, it’s much more complicated than that. I think there’s a lot of interpretation to be done and Kramer vs. Kramer will hit different people different ways, but I really am struck by the complexity of everyone involved. Terms of Endearment has a similarly complicated view of how we interact with the people we love, but this is a much more difficult topic. Everything in Kramer vs. Kramer is a little difficult, but it manages to be emotional without being manipulative. The Best Part: The courtroom scene is fantastic, of course. Both leads give outstanding performances and earn their respective acting Oscars many times over, but it’s Ted’s lawyer that stuck with me. Played by Howard Duff, he’s tasked with destroying Joanna on the stand. He’s brutal, and it speaks to the fact that even though Ted and Joanna are trying to make this as positive as they can, no one escapes these situations that way. The Worst Part: Many Oscar winners go through some revision after the fact. Kramer vs. Kramer‘s version of that is a disagreement with my notion that both sides are played equally in the custody battle. Since the movie is from Ted’s perspective, mostly, it can be easy to side with him against Joanna or to paint her as flighty or “crazy.” I can definitely see the argument that it’s a proto version of “men’s rights” nonsense, but I disagree with that take. Is It Better or Worse than Crash? I’ve said this a million times at this point, but it all goes back to realism. I feel for Ted and Joanna. Ted wants to make enough money to provide for his family and Joanna wants to hold her family together. No one is “bad” in Kramer vs. Kramer, they just make bad choices because they don’t have time to consider if they’re even making a specific choice or not. Ted works too much and Joanna keeps her problems inside. Neither of them works on their marriage with the other one and thus it fails them and Billy suffers. The message of Kramer vs. Kramer is that you have to be well-rounded in your life and take care of every aspect of your humanity. Crash would tell you that it doesn’t matter, because all people are villains at their core and all people are waiting to literally kill each other at the slightest provocation. When the “divorce-and-custody-battle” movie is the happier, more hopeful movie then you’ve really taken a wrong turn.